Mexico’s Colima volcano has spewed ash and smoke over nearby towns, after erupting again at dawn yesterday. Video from the scene showed thick plumes of black smoke billowing from the mountain. The ashes and smoke have reached two kilometers into the air showing renewed activity, blanketing nearby villages with ash. Colima, also known as Fire Volcano, is located in the country’s west, about 125km from Guadalajara in Jalisco. It is the country’s most active volcano and has erupted more frequently since 1994, according to Volcano Discovery. Hundreds of people were evacuated from nearby towns in July amid fears of a major eruption. 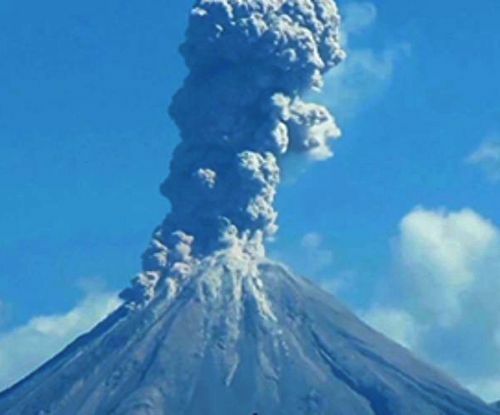 This entry was posted in Volcanoes and tagged ash, ash cloud, colima, erution, evacuation, mexico, Volcano. Bookmark the permalink.